Marcelo Bielsa’s men know they cannot afford many more slip-ups if they are to achieve their automatic promotion aim and no let-up in intensity will be expected when the Owls are in town. But while Leeds were winning 2-0 at Preston, Steve Bruce’s men were beating Nottingham Forest 3-0 to keep their top six hopes alive and they will arrive at Elland Road as dangerous opponents with plenty to play for. With ground to make up from their current ninth position they will be desperate for victory so another exciting and potentially tense teatime fixture is in prospect. It has been win one, lose one in the last five matches for the Whites and they will be hoping to break that sequence after producing a timely classy display at Preston in what had become a must-win game following the disappointment at Birmingham last Saturday. Head coach Bielsa was delighted with the display, which answered back at critics who were saying Leeds played were lacking the bottle to win their promotion fight. He said: “In the first half we deserved to win the game because we created four or five chances. They created one or two. “The red card prevented one very clear chance and if you analyse the game 11 versus 11, we were the better team. I don’t want to say that we won the game because we played with one player more. “For a long time we’ve been playing well. Against Birmingham we went down in performance, especially the last 30 minutes, but the team played like we’ve played all season. 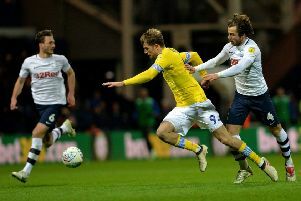 Bielsa praised the efforts of two-goal striker Patrick Bamford, who he showed faith in despite disappointing recent displays. He added: “He recovered very well from one difficult game. He didn’t play well against Millwall, but against Birmingham he increased the level of his performance. “He had three chances in that game and that’s something to talk positively about for a striker. “Now he’s improved his performance again with two goals and a lot of work for the team.